As the summer is upon us, we begin to think of the kinds of swimwear that we will be wanting to wear this season. This could be for a trip you want to take to a resort where you will rest on the poolside of for taking those perfectly stunning selfies on the seashore. You can always refer to the following trending styles that we have carefully handpicked especially for you. Accessories like belts are meant to attract attention to specific parts of your body. So just like a nice clamp around your hair will draw attention and enhance them, a belt that will go with your bikini bottom will draw attention to your waist. So if you’re willing to flaunt that beautiful waist of yours. Belted bikini bottoms are in this season just for girls like you. These elegantly crafted pieces will also give you a sense of nostalgia as they will remind you of the fifties and the sixties when they were a trend. However old the idea might sound, they have definitely given a fresh take towards designing bikinis that were once dominated with excessive fringes and layers. The spring like all other seasons has come with its own set of trends this summer. One such trend that dominated the markets is that of fruit prints. From bags to dresses to even heels, this print hasn’t spared any domain of fashion. Why would bikinis then be any exception? 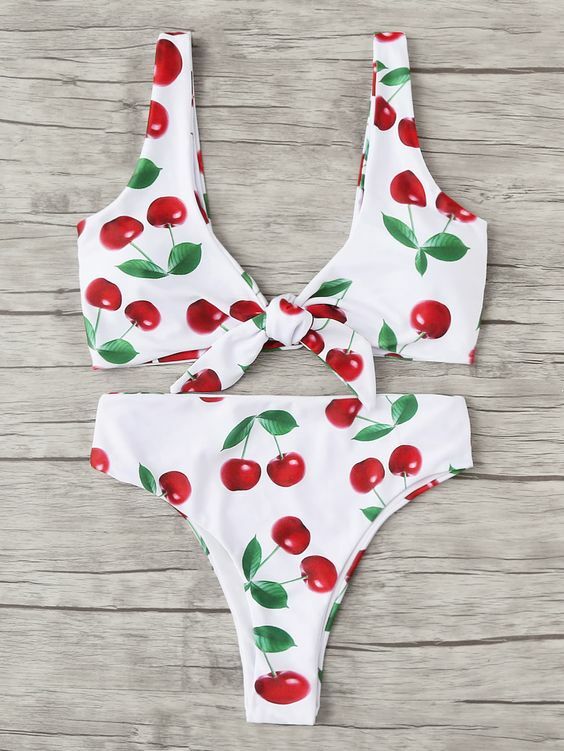 This set of bikinis will not only give you the perfect look for the spring but will continue to be your favourite in your wardrobe as the other seasons come by and you are looking for something that will feel fresh and rejuvenating to you. Velvet does give the most classy look that you can expect from a bikini. But how practical would that be? We saw Kylie Jenner post a picture on Instagram in green velvet bikini and most of us would have thought that such swimwear would be only good enough only for an Instagram post. However, that isn’t true. This trend isn’t impractical as you think and can be the one that will set you apart. The velvet can stretch very well. It is made up of nylon and Lycra, the same composition as regular swim fabric. While shopping for such pieces though it would be in your best interest to look for fabric with a four-way stretch.You can choose from a variety of crushed pink velvet, shiny deep-red velvet, baby blue velvet and black-velvet swimwear. There are times when you are ready to compromise on your comfort for fashion. Other times you are just looking for functionality. Say you like to go for a swim in your neighbourhood pool and need a bikini that is more functional than the ones we have discussed so far. The Sports Bra Top will be your choice.One trend that always runs deep into the market is that of High Leg Bottoms. The Sports Bra can be classified into this category. The one style that has been going on since what seems like forever is that of the simple yet elegant black bikinis. This piece of clothing will come to your wardrobe and stay. The best part for these will always be that you will not have to worry about your size while wearing these. Just make sure they will fit you well. From marigold to bright orange, swimsuits in these warm shades will make you glow. Think of any hue that reminds you of the sunrise, and run with it. After all the sun will always compliment your attire. Having said that, one must also remember that while choosing the appropriate bikini color, one must take into consideration the skin tone that you have.